This Machaca Beef Tacos Recipe is for a busy, weeknight meal. Just throw the ingredients for the macacha beef into your slow cooker and forget about it. Garnish the tacos with fresh and healthy salsas for and easy dinner. Whew! The Thanksgiving dishes are finally done, the company is gone and I’ve got my “shopping” shoes on. I’m not one to jump into the crowds for “Black Friday Madness” or battle it out for reindeer sweaters so, I’ve got a lot of catching up to do. That’s where my mom’s Machaca Taco Recipe comes in handy. This is my go to recipe when I know I’ve got a crazy week ahead—like work, meetings, deadlines AND shopping, decorating, baking. I’m sure you have one or two of those weeks coming up, as well. One way to avoid getting stuck in the fast food lines or the take out pizza rut is to cook up a big batch of Mom’s machaca taco meat and use it for several different meals. 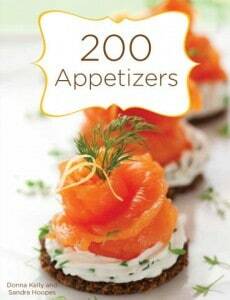 Talk about a fast and easy way to make real homecooked food for your family in only minutes a day. Now, I’m not usually a leftover fan but, with a little planning, your family will never know that this machaca taco meat is a leftover at all. 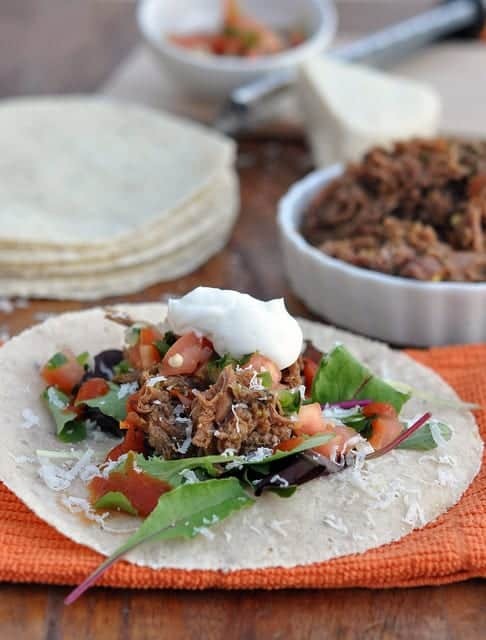 The key is to cook the machaca taco meat with very mild spices so that you can change the flavors and make several different meals out of the same batch. First up, Machaca Tacos with loads of fresh greens, fresh salsa and just a touch of sour cream on warm, soft, corn tortillas. A day or two later, I took about half of the leftovers and mixed it with my favorite BBQ sauce and made BBQ sandwiches with a fast and easy cabbage, jalepeno slaw. For the last meal, I sauted some diced pre-baked potatoes with sliced onions and poblano chile (you can use a green pepper if you wish). Then, I added the last of the machaca meat and “stir-fried” it with the potato mixture until it was warm. The potatoes are very traditional with machaca and are a great way to stretch that last portion of meat. Just roll it up in a fresh flour tortilla and top with enchilada sauce, guacamole or any of your favorite southwest garnishes. The machaca meat also makes a great taco salad. Just top some fresh greens with the machaca meat and garnish with a little grated cheese and a touch of sour cream. I always use a chunky salsa and skip the salad dressing—it’s way less fat than the usual salad dressing. These fast and easy tacos are my "go to" recipe for busy, week night meals. Mix the cubes of beef stew meat and pork shoulder together and place in a large slow cooker. Add spices, garlic and green chiles. Toss together until evenly distributed. Cook together over night on low temperature. Remove the taco meat from the slow cooker and chill until the meat cools and the fat floats to the top and becomes hardened. Remove the fat. Divide the meat and separate for other upcoming meals according to desired number of servings. Refrigerate or freeze for future meals. Reheat the taco meat in its own juice. With a fork, gently pull or shred the meat. 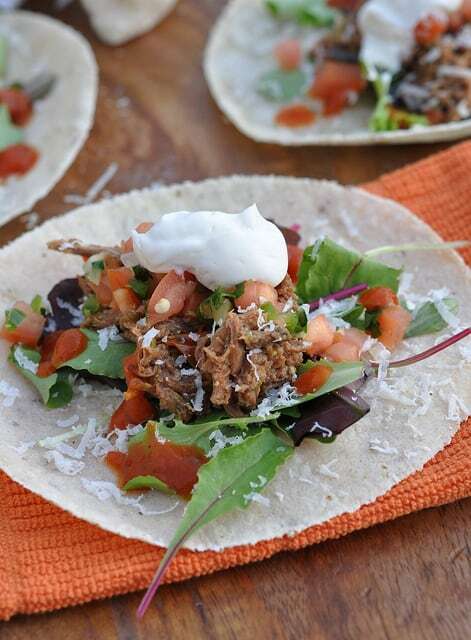 Serve Machaca Taco meat on corn tortillas with your favorite southwest garnishes. Mix the cubes of beef stew meat and pork shoulder together and place in a large slow cooker. Add spices, garlic and green chiles. Toss together until evenly distributed. Cook together over night on low temperature. Remove the taco meat from the slow cooker and chill until the meat cools and the fat floats to the top and becomes hardened. Remove the fat. Divide the meat and separate for other upcoming meals according to desired number of servings. Refrigerate or freeze for future meals. Reheat the taco meat in its own juice. Serve Machaca Taco meat on corn tortillas with your favorite southwest garnishes. I’m sure you can think of your own ways to use the machaca meat. Let me know what you come up with. We’re on the same wavelength this week, though I’ll be cooking ahead for the crowd that drops by to watch the Christmas Ship Parade. The baked potato bar will have machaca as one of the topping possibilities. Hearty food to warm up after chilly caroling on the dock! C’mon by and join us on the 5th. This post brings back lots of food memories for me. This is still one of my very favorite tacos ~ I make this all the time and think of Mom the whole time – such an easy “Mom” kind of recipe, and so delicious! Great ideas and they all sound delicious! I’m ok with leftovers, but it’s even better when you can make them taste like a new meal! I love this! My family would love this. How great to have it in the freezer ready to use. I always loved the delicious smell in the morning from the meat simmering all night. It made scrambled eggs taste scrumptious as you separate the freshly cooked meat. This looks absolutely wonderful. I’ve never made my own tacos, what a great recipe 🙂 Thanks for sharing! I love the idea of cooking up a big batch of something and using it in different meals! I find I can talk my husband into helping me cook a bunch of stuff on Sunday evenings to last us at least part way through the week. This is perfect for that. Thanks!